Thrice is the studio of paper illustrator and photographer, Alicja Colon. She crafts one-of-a-kind images for tech companies, editorial pieces, and products. After completing her degree in graphic design, she promptly gave up artboards for apertures when she discovered photography. After a 10-year stint as a photographer Alicja discovered the flexibility of paper imagery and fell in love. Now there’s a studio. Work with the client, not for. Together, there’s a better solution. Communicate with precision. Includes underlying intention behind both personal and commercial messages. Always stoke the fire of innovation by staying curious. Teaching paper craft, photography, and Photoshop basics in one 3-hour workshop. A workshop for conferences or agencies who desire to expand creative thought processes. With all materials provided, students move through the process of paper crafting, photography, and retouching as you create a craft alongside of Alicja. 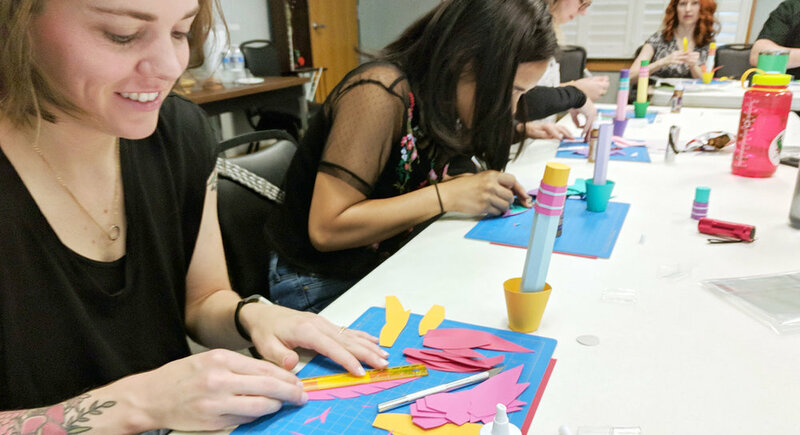 Students will walk away with a paper craft project, a kick-bootay photo of their project, and have a better understanding of how extend their creativity through exploration and curiosity.